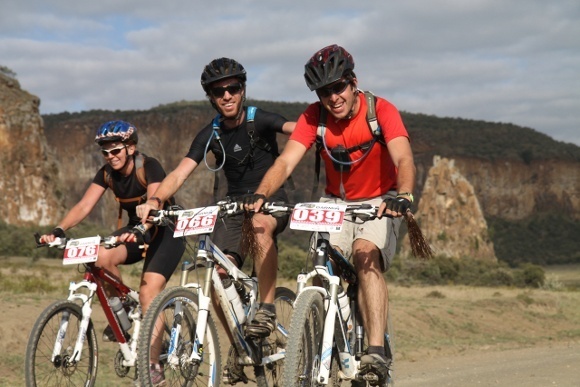 Memorable Bike Race In The Rift Valley! 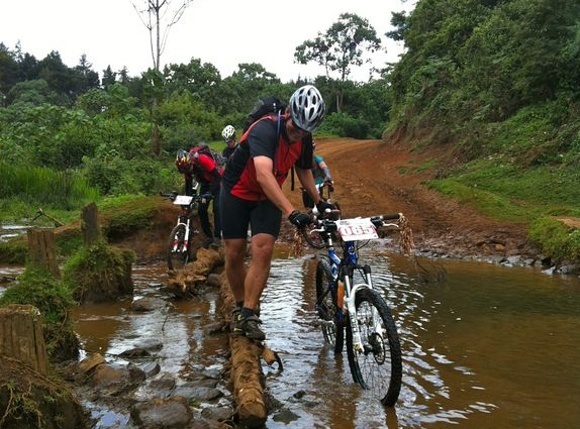 Every year in the month of September, there is an exciting bike race in the Rift Valley in Kenya. 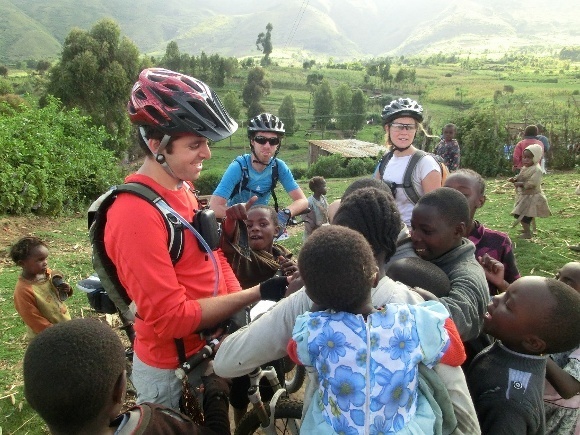 Known as the Rift Valley Odyssey, Enchanting Travels‘ Co-Founder Florian Keller and his friends participate. Fellow team member Elena Olivi shares her experience. 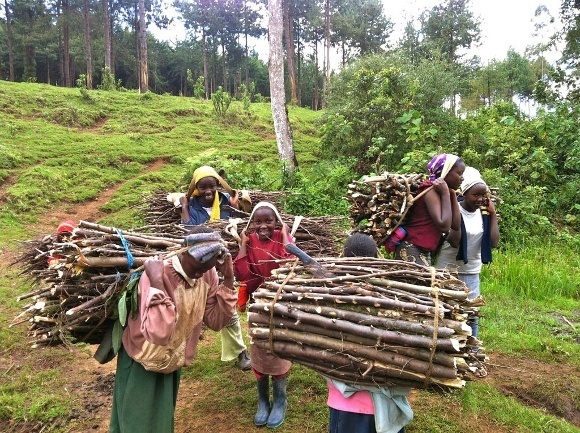 “Try your best!” was the advice of a precocious nine-year-old bystander to me as I slogged up a relentlessly steep dirt track somewhere along the Mau Escarpment. A salty mud, which – it turns out – is what you get when the dust you’re biting from real mountain bikers’ wakes mixes with your own profuse perspiration, was dripping off the tip of my nose. I gave the kid a grimace of a grin and a grunt of a greeting. I couldn’t decide whether to consider his comment adorable or patronizing. I thought about it for a while. By the time I reached the top of the hill, I decided the verdict didn’t matter, because the only emotion I truly harbored for that kid was gratitude… gratitude for having provided me a few precious moments of solace while my mind was distracted from the self-flagellation I had signed myself – and four other friends – up for. 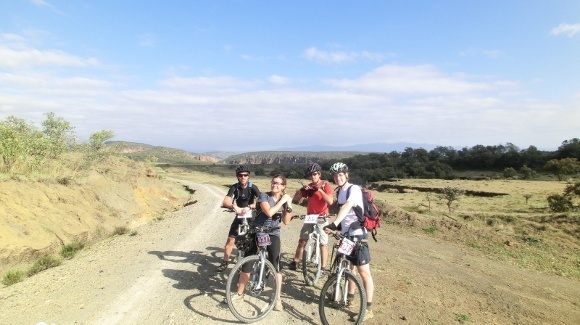 This is not to say I didn’t enjoy the three day Rift Valley Odyssey (RVO). 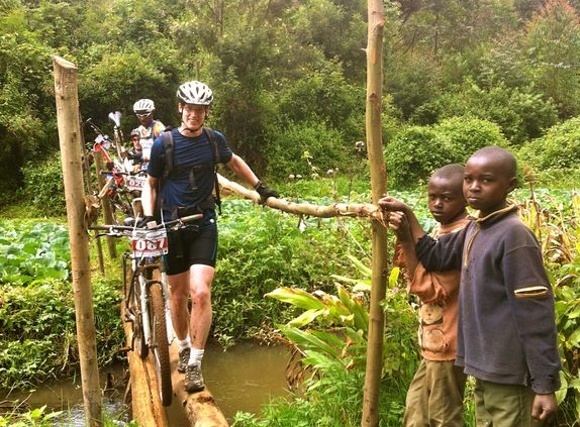 In fact, it was probably the best thing I’ve done in Kenya since I arrived over three years ago. There is something extraordinarily satisfying in realizing that after depleting the mitochondria of every single cell in your body to summit the first big hill, there’s still more grit left in you for another fourteen. However, in that particular moment my vision was blurred by mirages of Tusker malts, smooth tarmac, and the blissful era that predated the invention of the bloody wheel. Forget the perils of re-inventing the wheel; I reckoned humanity would have been better off without it the first time round! I cursed the cheeky Mesopotamian inventor of the fourth millennium BC. Let’s see the dude navigate “Lunatic Express” or “Jason’s Climb” of the RVO. THEN we can decide whether his eureka moment deserves such a prominent role in the cliché board room conversation of every Fortune 500 company. That said, no matter how much the Rift Valley Odyssey may have caused our man to regret his dalliances in round object engineering, I dare say he would have enjoyed the light-hearted company of the our contingent. We were a rag-tag group of amateurs that no one thought stood a chance even to finish the course. We had hardly trained. We set a recurring alarm to remind ourselves to stop for a leisurely snack every hour, on the hour. We used the green slime meant to prevent punctures in our tires to reenact scenes from the movie Ghostbusters. We overslept. We were thrown off our bikes constantly. We got lost. We never, EVER saw the front of the pack. We affixed tassels to our handlebars, for chrissake! … And what are clip pedals, again? 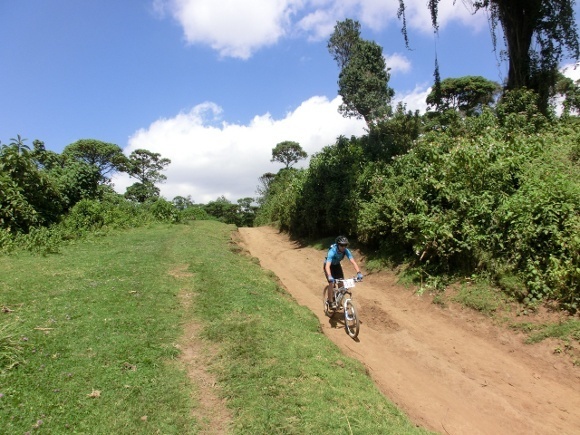 Our jokester attitude was, on one hand, magnified by the serious biking talent that surrounded us, and on the other hand, drowned out by the sweeping natural expanse of Limuru tea estates, the Aberdares, and Hell’s Gate National Park, which served as our backdrop. 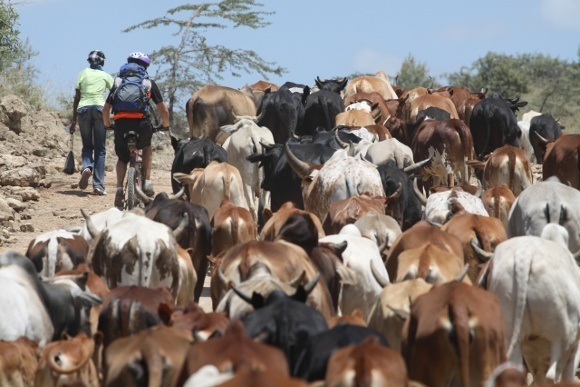 Professional and semi-professional riders from across Africa participated. Arguably the best cyclist of Kenya, David Kinjah, was on the roster. South African die-hards made the northward trek. A three-time mountain biking Olympian from Namibia turned up. No big deal. By the time we got back to camp every night, our loyal fanclub of one – the wife of one of my teammates – and a hoard of crickets were the only sentient souls around to welcome us home. The other racers had long since eaten, showered, and retired to their tents… where I presume they were all frantically doping and transfusing blood because I don’t see how regular-person hearts and calves and amygdalas (that’s the part of the brain that controls fear down impossibly narrow, mangled, precipitous single-tracks, according to the Physicians’ Desk Reference) could perform the way theirs did. Seriously, their skill was unreal. Hell’s Gate National Park took on a new life in the RVO. It’s a shame that park is sometimes treated as the scrawny, illegitimate son of the Masaai Mara and Amboseli. It may lack big game, but moving throughout the park on one’s own steam, unencumbered by a cage of steel and seatbelts, levels out the playing field between us and the zebras, giraffes, warthogs, and buffalo in a truly unique and humbling way. The closest thing to a predator was a sky so vast it seemed like it could swallow us whole, with nary a bone or event-issued emergency SOS bracelet left behind for our mothers. 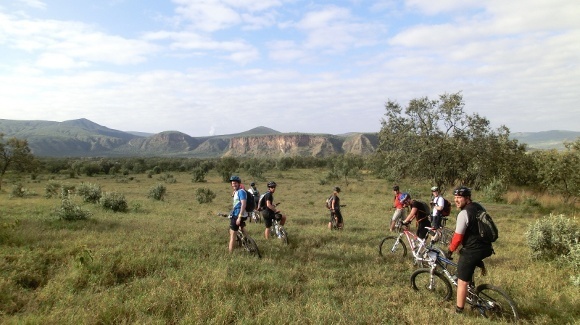 Other examples of Hell’s Gate’s bounty include a gorge, excellent rock climbing, steam jets from the geothermal power field, arguably the best campsite within spitting range of Nairobi, and gorgeous vistas of Lake Naivasha. The RVO course had us explore every untouched corner of the park, and my appreciation for this gem of a place swelled. My boss might warn me to avoid reinventing the wheel, but I most certainly intend to repeat the Rift Valley Odyssey. Cheers to Mesopotamia and to trying our best. 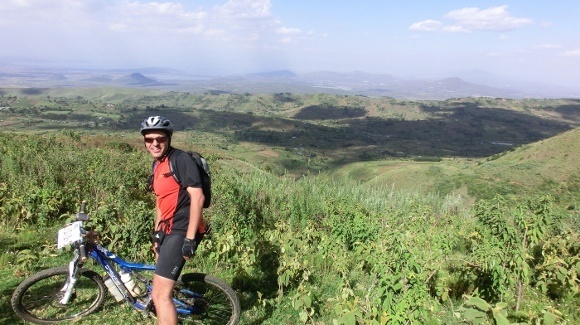 Discover the beauty of Kenya’s Rift Valley for yourself with an Enchanting Travels trip! would love to bike in this place one day ! !